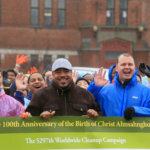 World Mission Society Church of God volunteers capped off an eventful 2018 with their latest “Mother’s Street” cleanup in Newburgh, NY. During 2018, ASEZ (Saving Earth from A to Z) volunteers beautified and cleaned up over 7,000 different regions across the world. Their initiatives, most notably their “Reduce Crime Together” movement, propelled university students and church members into the stratosphere of environmental protection and social activism. On November 11, ASEZ student volunteers from the U.S., Korea, South Africa, the Philippines and Peru gathered for an international forum, entitled ASEZ Talk Concert on Confronting Climate Change 2018. One day later, on November 12, the Church of God and ASEZ received the Gold and Bronze Green Apple Awards. Receiving a Green Apple Award is one of the world’s most prestigious environmental protection honors. The awards were given at the Green Apple Awards ceremony, held at the Palace of Westminster in London. Furthermore, on November 16, the U.N. invited ASEZ university students in the U.S. to deliver speeches for the International Day for Tolerance. 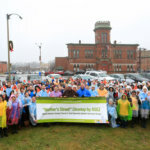 After an extremely active November, the Church of God in New Windsor continued the trend with a monumental cleanup of their own on December 16. 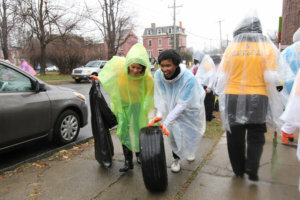 About 200 volunteers carried out a major cleanup in downtown Newburgh. However, the cleanup was not only part of the “Mother’s Street” campaign; it also fell in line with the “Reduce Crime Together” initiative. Studies have shown that where there is urban decay, crimes are more likely to occur. Conversely, crimes are less likely to happen in locations that are well-maintained. With this in mind, the volunteers went to Newburgh, ready to roll up their sleeves and get the job done to make a safer environment for residents. ASEZ volunteers removing leaves from a lot in Newburgh. ASEZ and Church of God volunteers came out in full force on Johnston Street. A couple volunteers roll an abandoned tire down the street. Though the forecast was about 35 degrees with freezing rain, that couldn’t stop volunteers from coming out in full force. 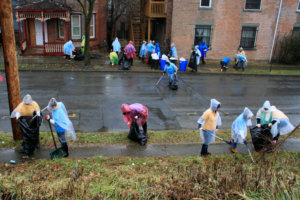 It was all hands on deck as ASEZ and Church of God members cleaned up three streets off Broadway: City Terrace, Johnston Street and Lander Street. Mayor Torrance Harvey and the Newburgh City Council, whom the members worked with to organize the cleanup, recommended the streets. Volunteers gave special attention to a makeshift basketball court that children created in an empty lot on Johnston Street. The members removed several abandoned items, such as tires, a washing machine, a couch and more. They also removed weeds, fallen branches and various overgrown plants from the lot. As a result, the volunteers collected about 50 bags of trash, along with several hundred pounds of loose rubbish. Through their efforts, the volunteers hope to not only improve the city’s appearance, but also positively impact the residents. The ultimate goal is to create a safer environment for children and to improve the overall quality of life for the community. Newburgh is known for its rich history and scenic surroundings. 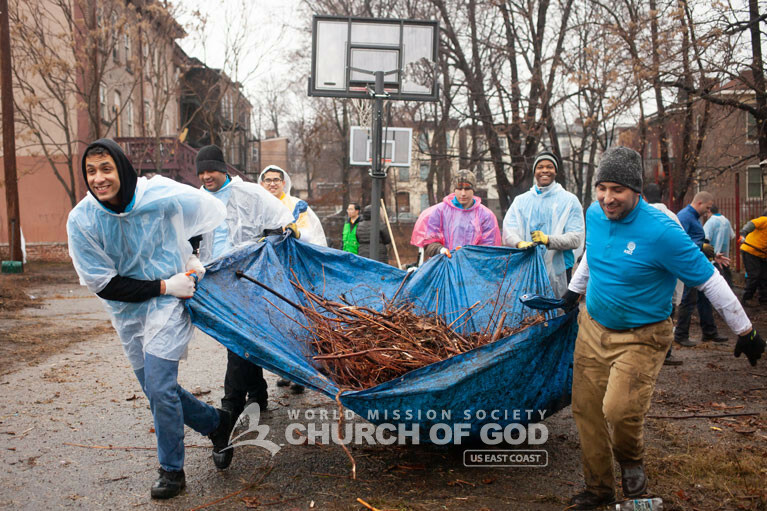 The Church of God will continue to work with the City of Newburgh to beautify the streets and promote positivity in the community to bring out the city’s positive attributes. Interested in volunteering at our next community service? Contact us to learn more. Mayor Harvey together with the ASEZ volunteers during the “Mother’s Street” cleanup in Newburgh. Volunteers removed weeds and trash from a makeshift basketball court where children play in Newburgh. Volunteers stand with the heaps of trash collect during the Newburgh cleanup to reduce crime. Group shot of ASEZ and Church of God volunteers at the “Mother’s Street” cleanup in Newburgh.